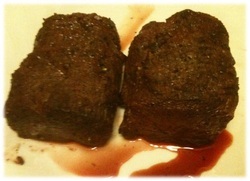 Grilled venison (a.k.a deer meat) is a really lean red meat alternative to grilled beef. Due to this, venison is great when you allow it to soak in a marinated for a few hours before you slap it on the grill. The marinade will actually penetrate the venison steak meat and add moisture throughout the cooking process. This will leave you with a juicier, more flavorful steak. Just make sure you don't overcook your steak or it will cancel out the effects of the marinade. This is especially true because most venison steaks are cut thinner than your average beef steak. Combine your venison steaks, Italian dressing, olive oil, garlic, onion, salt, and pepper together in a large bowl or gallon zip-lock bag. Place your bowl or zip-lock in the refrigerator to marinate. For best results, marinate the venison steaks for 12 hours before grilling. When fully marinated, turn your grill on and set it to medium-high heat if you are using a gas grill. If you are using a charcoal grill, make sure you have lit enough charcoal to form a solid single row under each deer steak. If you need more information on lighting a charcoal grill, visit our how to light a charcoal grill section. Due to the thin cuts on the venison steak, cook your steaks for 3-4 minutes on each side. If your steaks are cut to a thicker width, you will need to add a little more cooking time. When you pull your deer steak off the grill, allow them to rest on the plate for a few minutes before cutting into them, allowing for the juices in the meat to redistribute and keep the steak tender. During this time, you should see a little blood on your plate if you cooked them between rare to medium temperature, which is exactly how you want to serve deer steak. Learn more about how to check a steak for doneness.